Getting fit and staying fit is easier said than done. You can’t lose the weight you have gained over the years overnight. Going on a tough diet may help you lose some weight. But you should also work out often to stay on track with your fitness goals. iPersonalTrainer HD is a high quality app that brings hundreds of exercises and a number of useful tools to your tablet. iPersonalTrainer HD includes exercises that target various parts of the human body. 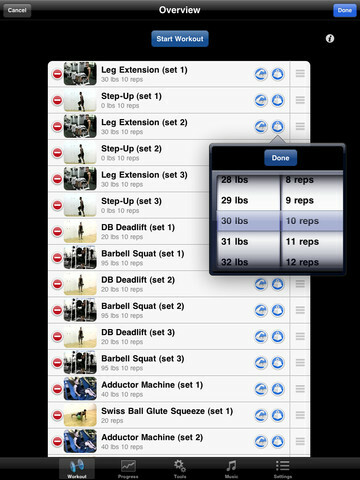 The app provides you with weights and reps for your workouts based on your settings and what you have done in the past. Whether you are looking to gain muscle, lose weight, or tone your body, this app has an exercise or two for you. You can use this to compare your before and after pictures. Picking music for your workouts is pretty simple too. iPersonalTrainer HD has a significant number of exercises and provides you with proper instructions to get started. It has a lot of potential.